Announced in July 2010, the DxOMark test results for this Canon super-telephoto lens shows that it has excellent resolution, with really very good homogeneity throughout the field. Distortion is simply nonexistent, there’s only a negligeable amount of chromatic aberration, and it has good stability. What vignetting there is not especially annoying, even though it’s a bit higher at f/2.8. It comes with a tripod mount. This all said, the f/2.8 is an expensive lens… and very heavy and cumbersome one to boot. Further, its transmission quality is disappointing for this type of lens (especially at the price). 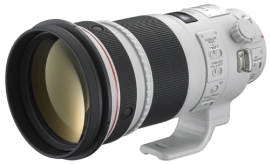 When compared to an older Canon 300mm super-telephoto (the f/4L), the Canon 300mm f/2.8 comes out ahead. As noted above, the f/2.8’s resolution is homogenous across the field – rather more than for the f/4L, even though the f/4L has a slightly higher score for resolution. Apart from that, the f/2.8 beats the f/4L in most categories (distortion, chromatic aberration, and transmission). The f/2.8’s main weaknesses remain its price and its weight – many times more expensive than the f/4L, and about twice as heavy. As for the Canon EF 300mm f/4L IS USM, per above, it has even better resolution than the f/2.8, and somewhat less noticeable vignetting. Moreover, it is lighter and less expensive. But it has poorer transmission and its resolution is less homogenous across the field. Overall, it simply is not as good a lens as the f/2.8. All in all, if price and weight make no difference, then f/2.8 is clearly superior to the f/4. But is it worth paying up to five times more than the f/4L? We will leave that question for our discerning readers to answer for themselves.